Your Dad is the best. 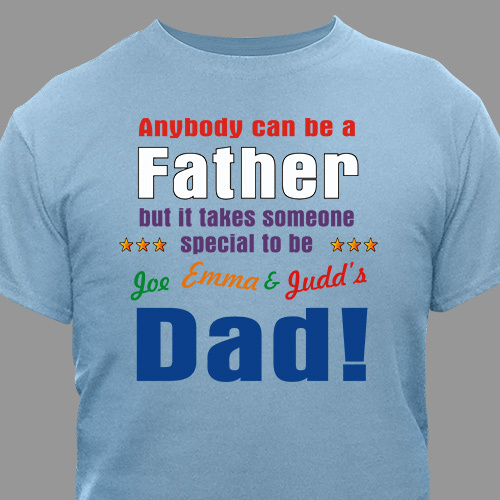 Why not make him feel like a million bucks with one of these Father's Day Personalized T-shirts. A handsome shirt, Dad will love to wear to family events, picnics or any special family vacation. Our Anyone Can Be A Father Personalized Shirt is available on our premium pre-shrunk 100% cotton River Blue Personalized T-shirt, machine washable in adult sizes S-3XL and makes a great gift for Father's Day. Your Dad Shirt includes FREE personalization! Personalize your Father's Day T-shirt with up to 30 names. The shirt is nice quality. My husband loved the shirt. Quality appeared to be very good. GiftsForYouNow.com has many unique and stylish Personalized Father's Day Shirts suitable for Dad, Grandpa, Uncle or Brother.Shop GiftsForYouNow.com for all your Custom Father's Day Gifts today!